Having a Facebook page is now becoming an essential part of marketing or promoting a business. Majority of people are already using Facebook so it’s most likely that your target audiences are all on Facebook. You’re guaranteed to reach your audience on this network. Reports show that Facebook had about 2.27 billion monthly active users as of the third quarter of 2018. It has a large number of active users compared to any other social networks. With these statistics, Facebook is with no doubt the best platform to sell your products and render your services. It has now become easier to get access to your already existing and potential customers, gaining more visibility for your business. The question now is; how do you leverage the use of Facebook as an online retailer to boost sales and drive conversions? Let’s find out how. First things first. Before you can sell on Facebook, you have to set up a Facebook business page. Fill out your Facebook page details. Furnish your page with the relevant description of what your business is about, hours during which your business operates and contact details which include telephone numbers, an email address, link to your website and a physical store address if any. Do not forget to add a call to action button on your page. Change your cover image on a regular basis and stay abreast with Facebook changes. As an online retailer, it will also be an added advantage to set up a Facebook shop as well. It is important to note that you can only set up a Facebook shop when you have a business page. Create content that your audience may like. Creating content is the gateway to driving sales for your business. Use pictures when posting on your page – a short copy and a picture can go a long way. You can also create videos or motion graphics using the resources that you have. They don’t have to be of super high quality. Standard quality is perfectly fine if you’re operating on a low budget. Remember to keep your videos precise and concise. Most effective videos are not more than three minutes long. With the millions of videos and activities to do on Facebook, no one has the luxury of time to watch a lengthy video, so it’s best if you keep it short and to the point. Your posts have a limit to the number of people that can actually view them. Even if you have a lot of followers, boost your posts so that they go far and wide. Once you have a well crafted and relevant content or post, people are going to engage with your posts. Together with sponsoring your posts, it is also important to create relevant content that can boost sales for your business and drive conversions. Sponsored posts take up a majority of the news feed so people are most likely not going to miss any contents or posts from you. Using Facebook messenger is a great way to engage customers who are interested in your products or services. Once people start engaging with your posts or showing interests in your business, you’ll want to take it to another level by sending them a message about additional information or content you may want to share. At this point, it is important to ask for their permission to send it to them. Let’s look at an example. If you’re an online business that sells home furnishings, you could ask those who engaged with your posts if they’d be okay if you could share with them more information about the post they commented on or liked. If they agree, share further content they would like to know about that particular post. In the images below, you will see that there are sections highlighted. The ‘message’ section allows you to initiate a conversation with someone who comments on your posts. In the same way, after your message is sent, the person is notified as shown in the second image. Running contests and organizing giveaways are great ways to create awareness about your business, create excitement about your brand and also a way to announce new products or services that you may have. Organizing giveaways when done properly will have people running to your business. Dove organized a contest dubbed ‘Real Beauty Should Be Shared,” where followers were asked to describe how someone represents ‘real beauty’. This was done to celebrate the natural beauty of people. The winners were chosen as the faces of Dove in a newly made campaign. Running contests create visibility and will attract people to your business. Turn your Facebook store into an extension of your storefront. 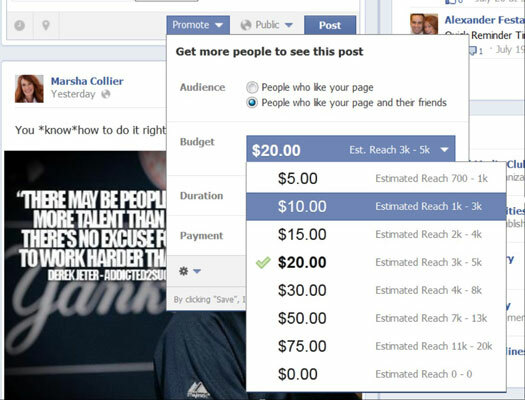 Offering special discounts that are also on Facebook will leave your customers coming back for more. Discounts entice people to purchase a product or use a service and it also allows already existing customers to return to your website to complete their purchases. If you want your customers to visit your business more often and increase their purchases with you, you can also use a rewards program that is exclusive to your Facebook fans only. This will help you keep your customers connected. First of all, you need to invite your Facebook friends to like and follow your business page. Let your friends, family, and customers share whatever products or services you have on their various platforms. Your potential customer may be on a friend or already existing customer’s timeline. The idea is to make sure your business reaches far and wide, which will help increase sales and drive conversions. Ask your loyal customers to refer you to their friends and other people they know. About 60% of all sales are influenced by word of mouth or referrals and this is because people tend to purchase a product or use a service when referred to by someone they know and trust. The easiest way to encourage people to share and refer your business is through a referral program. Managing a Facebook business page can be time-consuming. However, it is worth the time spent and hard work if you want to boost sales, drive conversions and see your business flourish. Social media platforms such as Facebook, Twitter, Instagram, Pinterest, among others, have completely changed the world of marketing. It has become essential to start utilizing these forms of communication to market your business. Here’s a piece on how to sell on Twitter to help in your social media marketing.